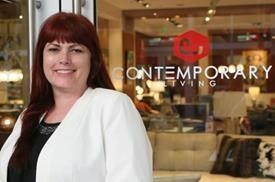 Cynthia Heathcoe, CEO of Contemporary Living furniture store, outside her store at Downtown at the Gardens in Palm Beach Gardens, won $5,000 as the 2016 Palm Beach SCORE Entrepreneur Extraordinaire. A once-homeless owner of a Palm Beach Gardens furniture showroom prevailed over two other northern Palm Beach County entrepreneurs in a contest to win $5,000 to make their businesses better. After what Heathcoe calls “a series of bad choices” 17 years ago, she found herself homeless with a baby less than a month old. The Lord’s Place provided her with a transitional apartment, where she and her son lived until she got back on her feet. Now her business accepts customers’ old furniture for The Lord’s Place’s residences. She and her husband, who helps her run Contemporary, live in the Acreage, according to the news release. “We are honored to be a part of this as an ongoing campaign that helps us give back,” Heathcoe said. She credits her guidance from SCORE and a small business administration loan with helping her fulfill her dream of becoming an entrepreneur. SCORE chair Penny Pompei, her mentor, said her success shows what hard work and determination can do. Dina Lauro of Chunky Dunkies, a Riviera Beach business known for its healthy desserts, and Amy and Scott Angelo of Oceana Coffee in Tequesta each received $1,000 as runners-up in SCORE’s Entrepreneur Extraordinaire awards, according to the release.